A spiritual retreat venue in a tranquil location for your groups next journey. A place were your group can feel happier, healthier, and practice healing of the mind body and soul. A serene 100-acre retreat center on the edge of the Ocala National Forest on the pristine shores of a private beach. Your spiritual retreat group will have exclusive access and will be able to use the entire location during your retreat. All meals are provided by our retreat center staff. There are a number of meeting rooms of different sizes that can be used for workshops, lectures, break-out sessions, meditation, or crafting. There is a theater and lecture room, equipped with an overhead projector for movies or presentations. All buildings are heated and air conditioned for year-round conditions. 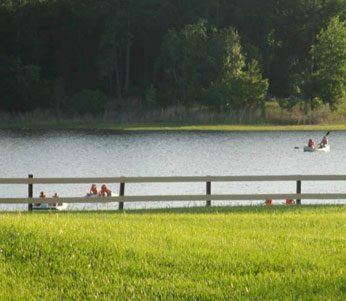 Within the gentle rolling hills of our beautiful Florida location, within this spiritual retreat venue your group will find all types of possible activities including swimming in our pool and lake, canoeing paddle boating, or kayaking. Our wide open sports fields for team games as well as indoor/outdoor basketball courts and 4 tennis courts are a great venue for your group’s retreat activities. Our ropes courses have a climbing tower with zip lines, a giant’s ladder, and many lower ropes elements where breakthroughs can be achieved! for availability, more info and all inclusive pricing for your group’s next weekend or full week Spiritual retreat! !